Last week I was given the opportunity to try out Game Face cooling wipes. Since I'm a two-sport athlete I was excited and eager to try them out. There's nothing worse out on the sand volleyball court that being all sweaty and having the sand stick to you, especially your face! Or having sweat run into your eyes when trying to catch a fly ball in the outfield. I opted to try the cooling wipes meant to energize and invigorate specifically because of the sports I play but there are several options to choose from. And they can be found at Walmart and GNC stores if you're in a hurry don't want to wait for shipping from the Game Face Grooming site. Our anti-bacterial “Warrior Wipes” are made with a mild hand/body sanitizing cleansing formula that kills germs and leaves the skin feeling clean & fresh. Our eco-friendly wipes are perfect for gym rats of all degrees to keep themselves free of MRSA and other staph based bacteria that are common in work out facilities. Our line of “Cooling Wipes” (Energize & Invigorate) are specifically designed to keep you cool in the hottest of situations, wiping away sweat without leaving any trace of residue. Cool down, energize & get back in the game. Our "Cleansing Wipes" (Refresh & Rejuvenate) wipe away dirt, grime, and sweat while also hydrating the skin. Game Face Grooming, the originator of men's athletic facial wipes! Our approach is original formulations built from the ground up for performance minded athletes! 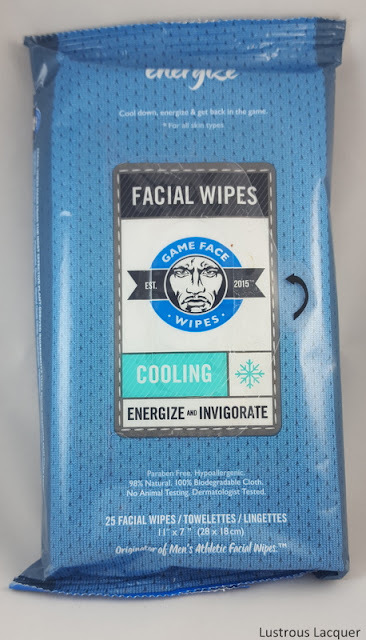 Game Face Wipes are designed to help athletes cool down, swipe away dirt and grime while gently exfoliating to even out skin tone and leave skin feeling hydrated and smooth! Stay fresh on the fly with Game Face Wipes! Whether you're soaking up the sun at the beach, hitting the gym, working on the construction site, landscaping the yard in the brutal heat, or simply just trying to catch your flight, Game Face Wipes are designed to help you stay fresh & clean while going about your daily responsibilities! I tested out the wipes in both situations and was impressed. Not only did they clean me off but they really did cool me down! And I love the fact that I wasn't left with a wet feeling on my face. The moisture evaporated almost instantly leaving me with cool soft skin. The wipes come in an easy to carry package similar to baby wipes and conveniently into fit into most purses and gym bags. The easy open tab makes it easy to grab and go and the wipes are huge! I'd have to say my only complaint is that the scent is a bit strong for me, It reminds me of cucumber melon which I like. This was just a bit much, thankfully it fades away withing 5 minutes give or take, depending on what you're doing. 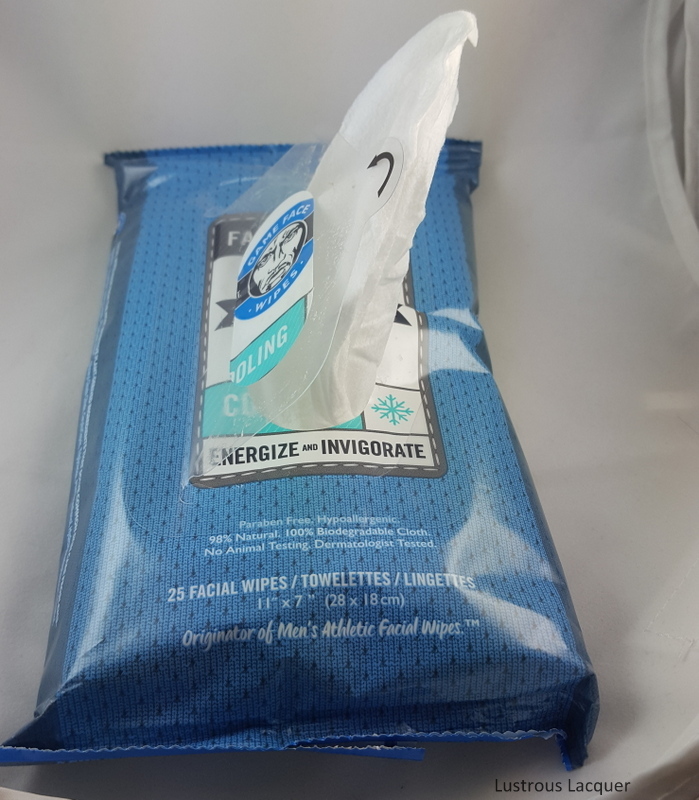 While game face wipes are primarily targeted to the male athlete they work great for both skin types and I easily see myself trying out the other styles. Well, that's all I have for today. I hope you enjoyed this post and I'd love to hear your thoughts in the comments. 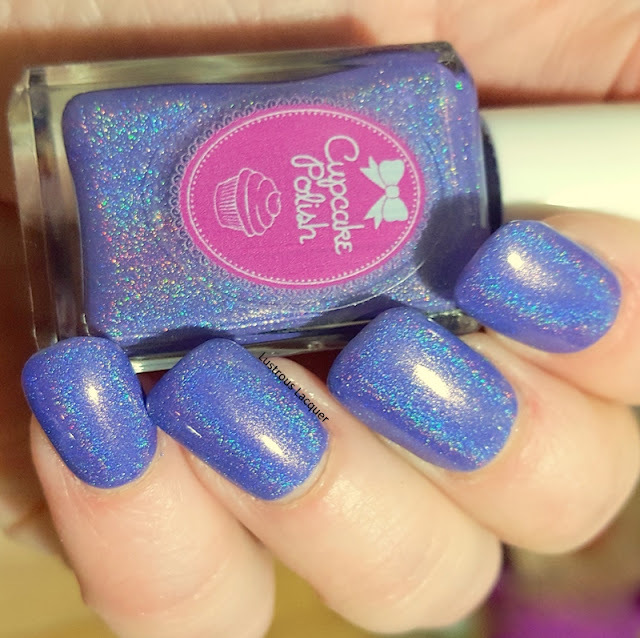 Back in October, my wonderful Fiance bought me my very 1st Cupcake Polish, in fact, he bought me 6. Am I a lucky girl or what! Today I'm sharing one with you that he picked out for both of us. Lilac you Mean It. You see his favorite color is purple and my absolutely favorite scent is Lilac. I get so happy in the spring time when they bloom and a bit sad a week later when they are done. 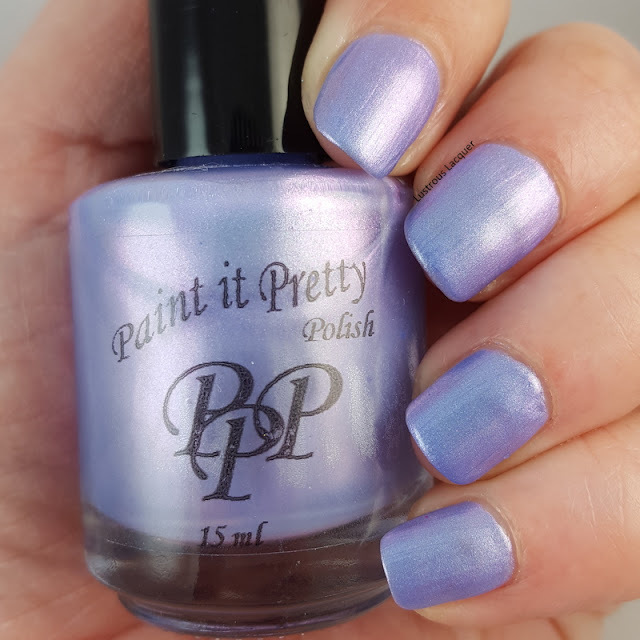 Now thanks to his generosity I get to have a beautiful lilac shade on my nails anytime I want. 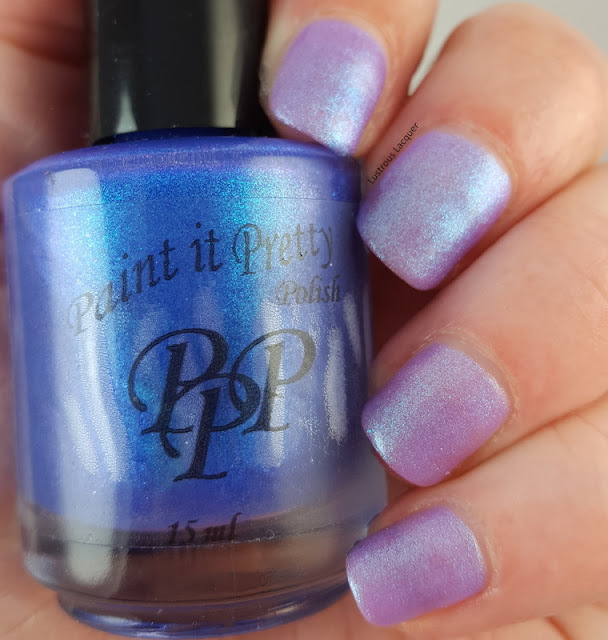 Lilac You Mean It is a medium purple linear holographic polish with a blue undertone. Sadly my camera picked up more on the blue than it did the purple. My macro shot is the most color accurate shot I could get. And believe me, I tried! I used 3 different cameras and as many lighting options as I could find. 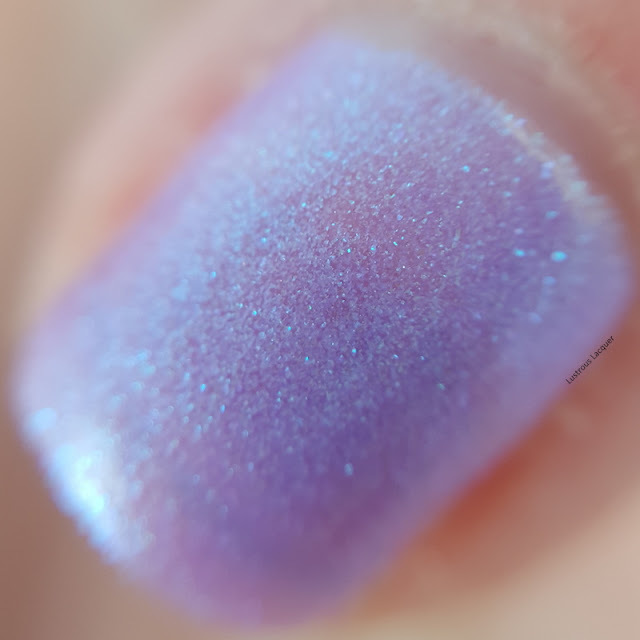 Lilac You Mean It has a smooth flawless application and as you can see a strong holographic flash. Shown here is 2 coats plus top coat. 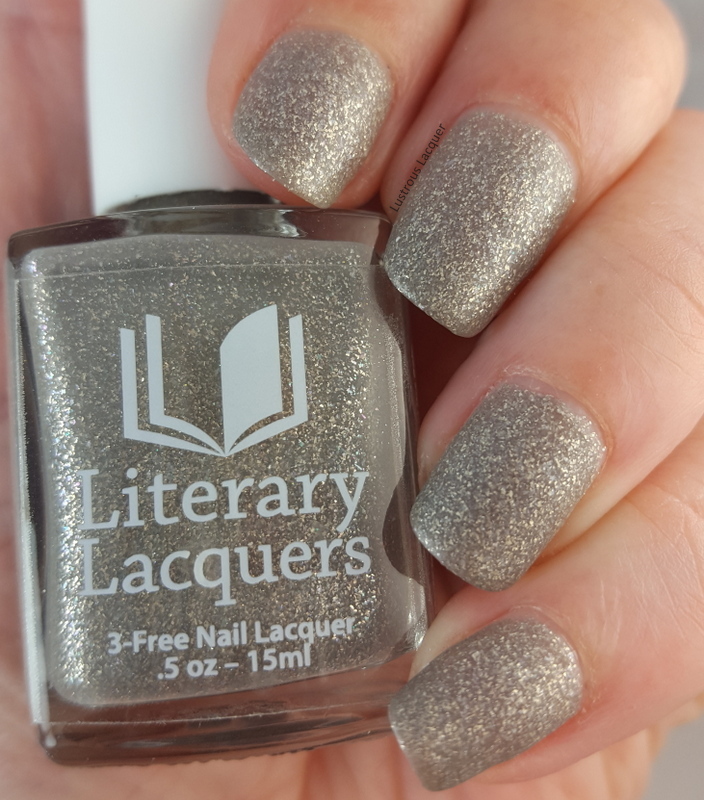 I have to say I don't own a single polish quite like this one. Sure I have a few lilac colors and a lot of holos but not both together. 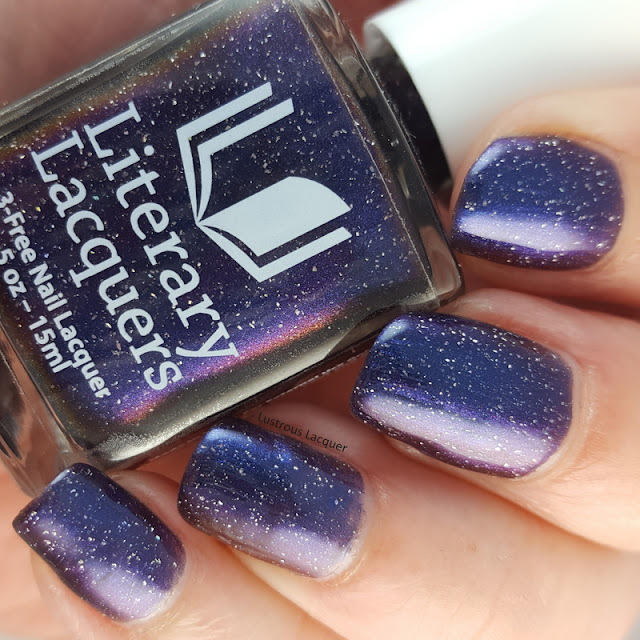 Sadly Lilac You Mean It is no longer available for purchase, but there are a ton of other beautiful holographic polishes to satisfy you. What are your favorites from this brand? Thanks for stopping by and Happy Polishing! Happy Saturday! I know I'm posting outside my regular schedule again but I felt that these polishes were too good to wait. Plus I didn't want any of you to miss out on getting your hands on them. 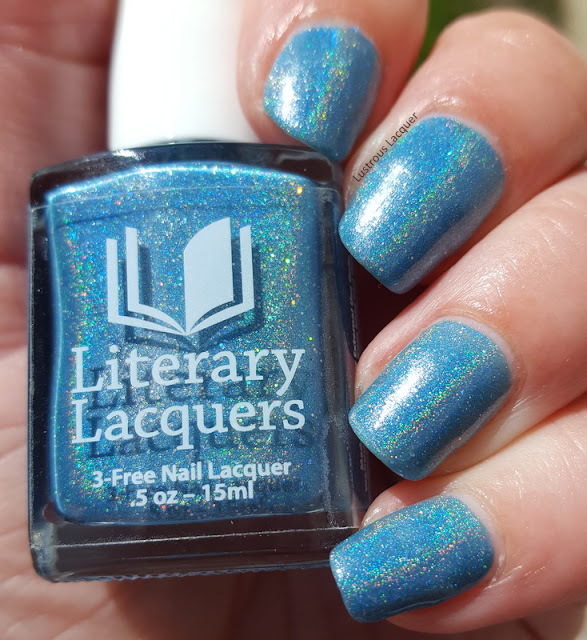 Did any of you pick up the Ocean at the End of the Lane trio from Literary Lacquers? 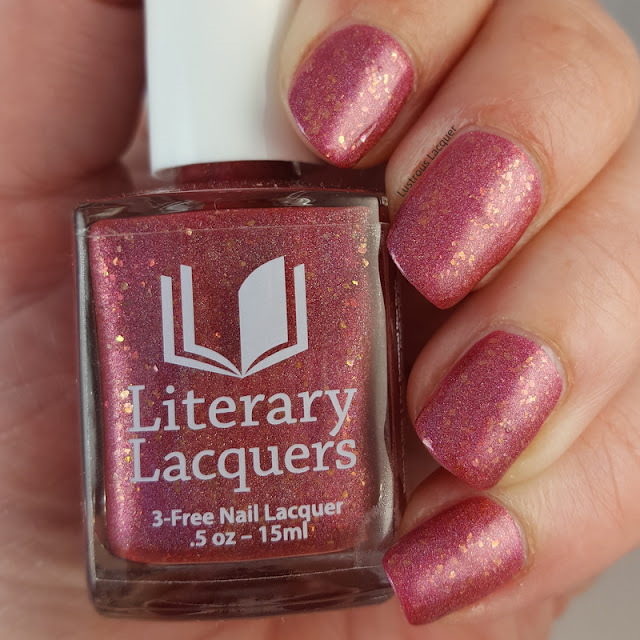 Well, I hope you're not done shopping yet because today I have 3 more beautiful colors to share with you: Feather Family, If Thou Hast Eyes to See and Porco Rosso. 2 of these are returning favorites and 1 is a free gift with purchase. Read on to find out more. 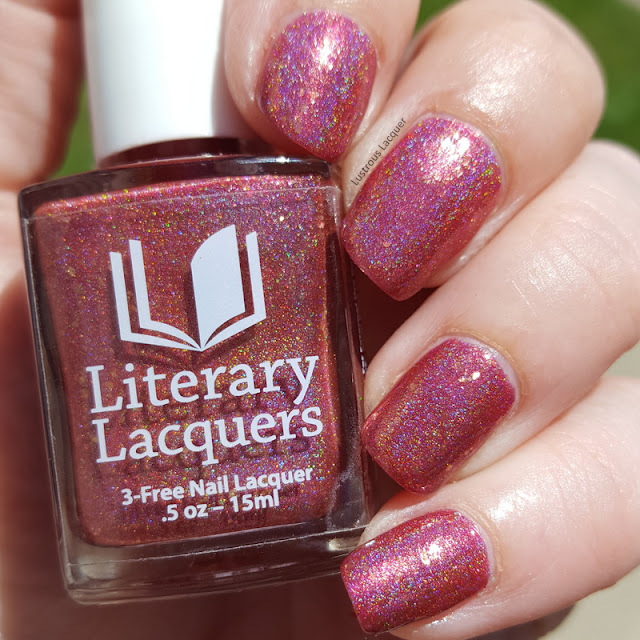 Porco Rosso is described as a deep red linear holo with taupe and gold flakies. When I looked at the bottle I saw a magenta linear holo with gold flecks. Released in 2014 as part of the Community Collection. Porco Rosso was created by Schette of SchetteEssaisBeaute and inspired by the book of the same name. Like Miner's Gift the formula on this one is a tad thicker than I'm used to but still very easy to work with. I had smooth even coverage and complete control over where the polish went. Porco Rosso is also extremely opaque and could be a 1 coater. Shown here is 2 coats plus top coat. 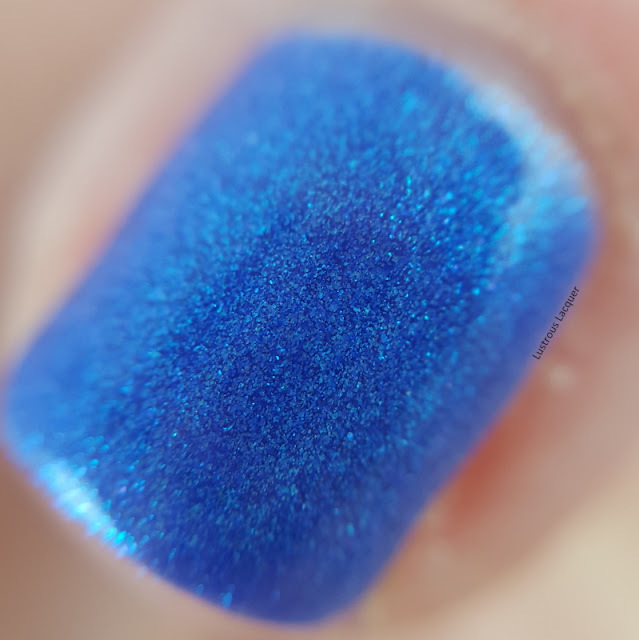 There are a lot of linear holos out there that are very similar to this. In fact, I've got a few sitting in my Helmers. But what makes Porco Rosso stand out from the rest is the addition of those Taupe and Gold flakes. If Thou Hast Eyes to See is described as soft sea green. Looking at the bottle I saw pretty much the same thing. 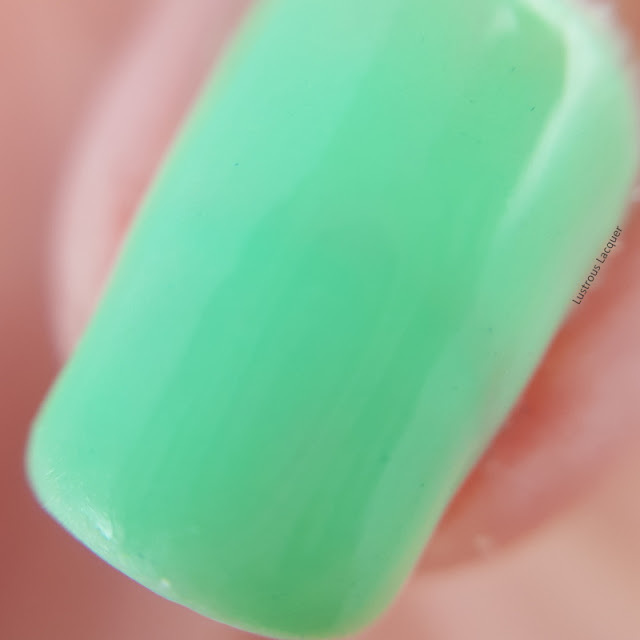 A sea foam green creme nail polish. 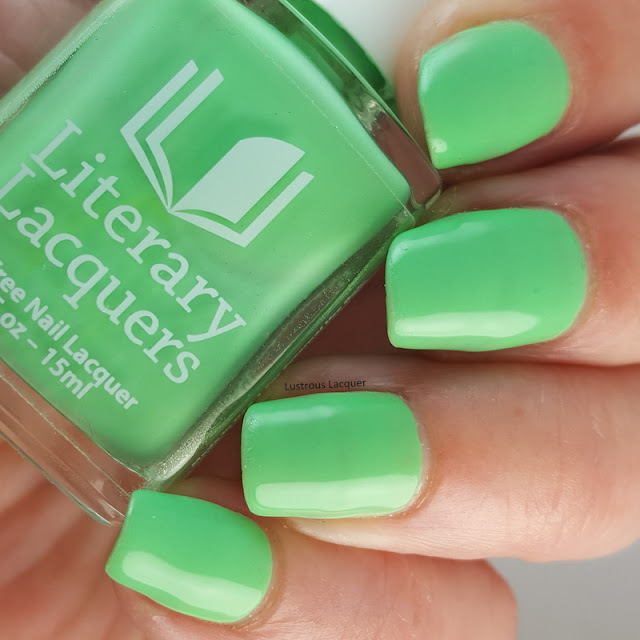 Released in the summer of 2016 as part of the Othello Duo this green is bright enough to catch attention but not so bright that it's eye-searing. The formula was a little on the thin side but not to the point where I had any pooling at my cuticles. On the first coat, I had some bald patches thanks once again to the horrible ridges in my nails. Everything evened out nicely and full opacity was reached after 2 coats. Shown here is 2 coats plus top coat. 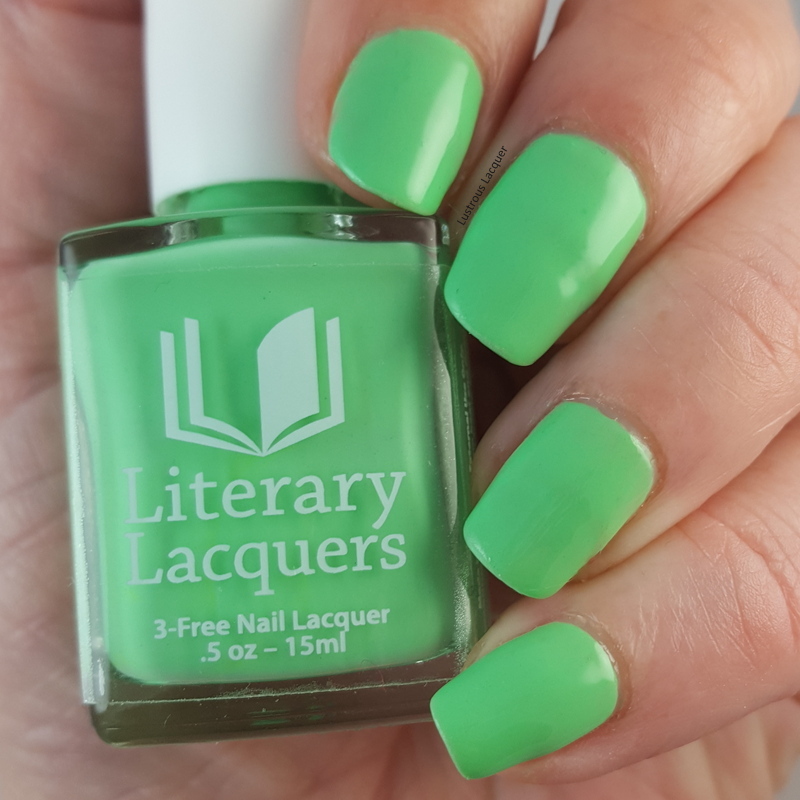 My daughter took one look at this polish and commented, "wow that's a bright burst of color on your nails." I had to agree with her, but I also smiled because it made me look tan. Which is a blessing to this Irish daughter of a redhead. 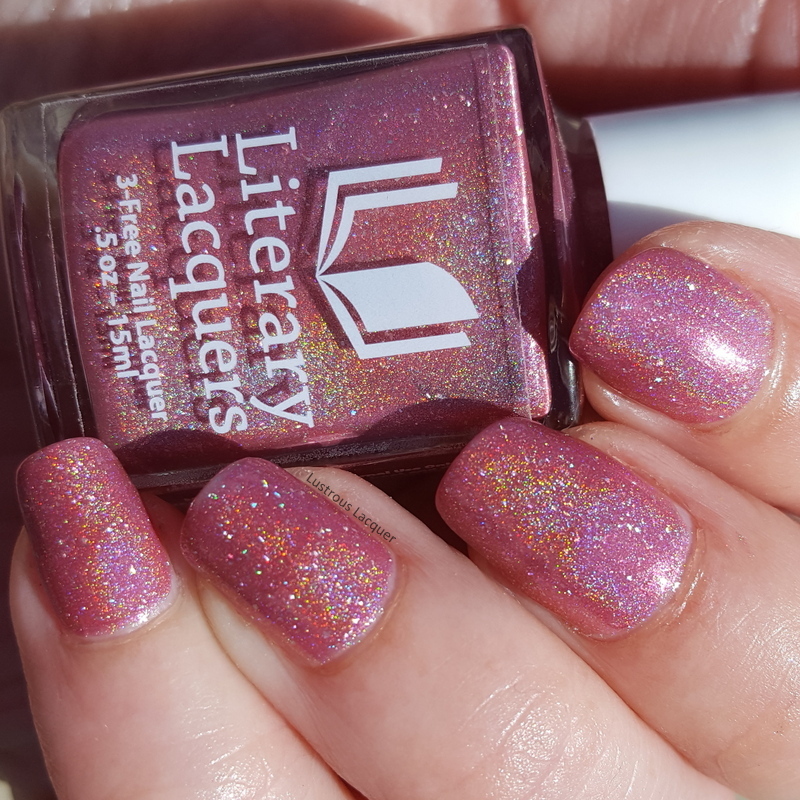 Feather Family is described as sparkling soft pink holo. 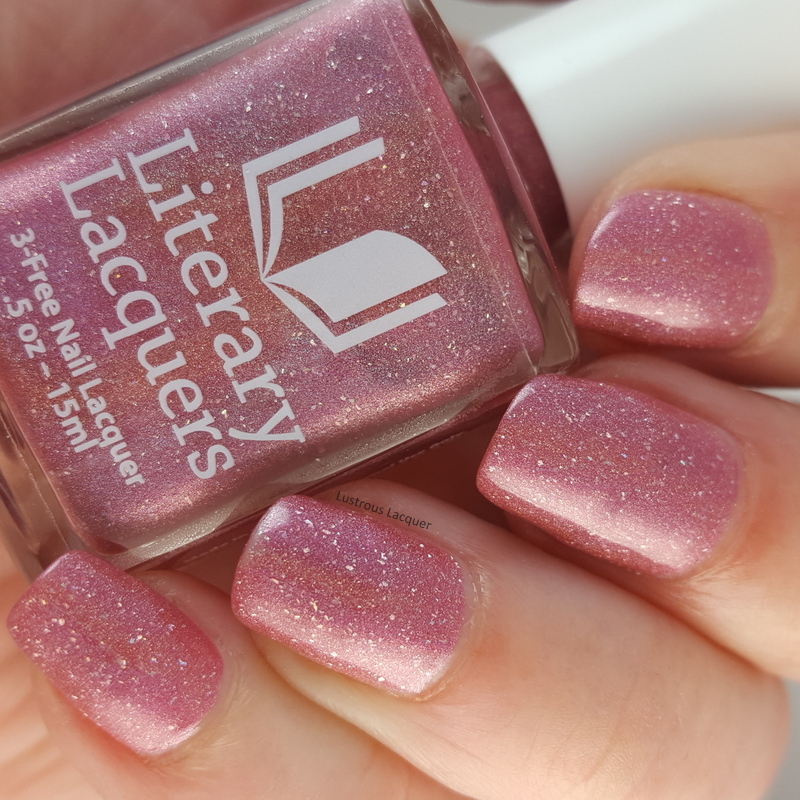 When looking at the bottle I saw a medium pink with scattered holographic glitters and a hint of linear holo flash. The formula on Feather Family is absolute perfection. I had flawless application and no catching or dragging on the ridges in my nails. Shown here is 2 perfect coats plus top coat. I feel this is just the right shade of pink for my skin tone. It's a hint darker than bubblegum pink which I love and it's a great color for summer. 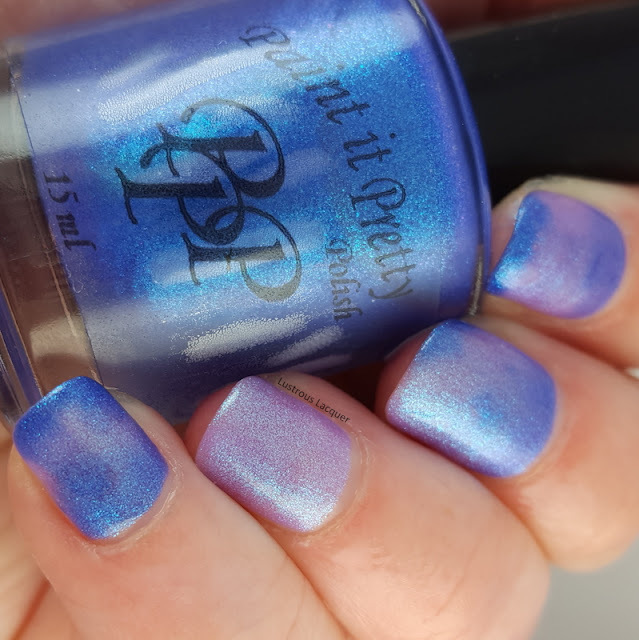 As mentioned above Feather Family is a gift with purchase polish. All purchases over $20 will get a free mini bottle and purchases over $50 will receive a full sized version. 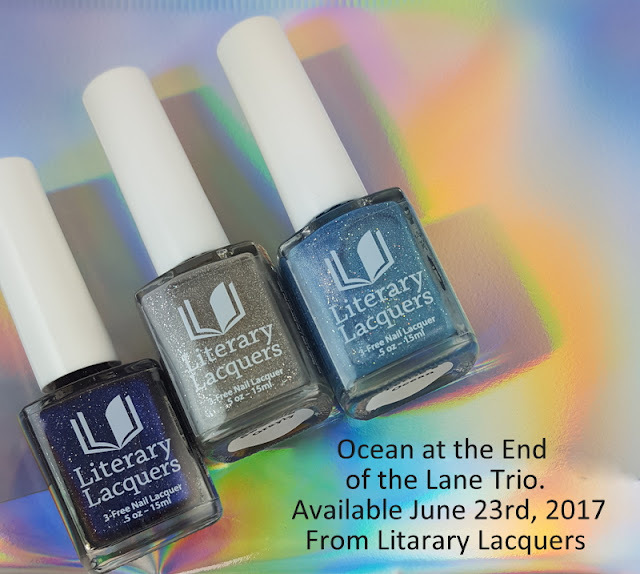 The Ocean at the End of the Lane Trio Released on Friday, June 23rd from Literary Lacquers at noon MDT along with some returning favorites. Want to know what they are so you can knock out some of those lemmings? Well, you're in luck I just happen to have a list! This is not a restock situation, the shop will remain open and stocked. 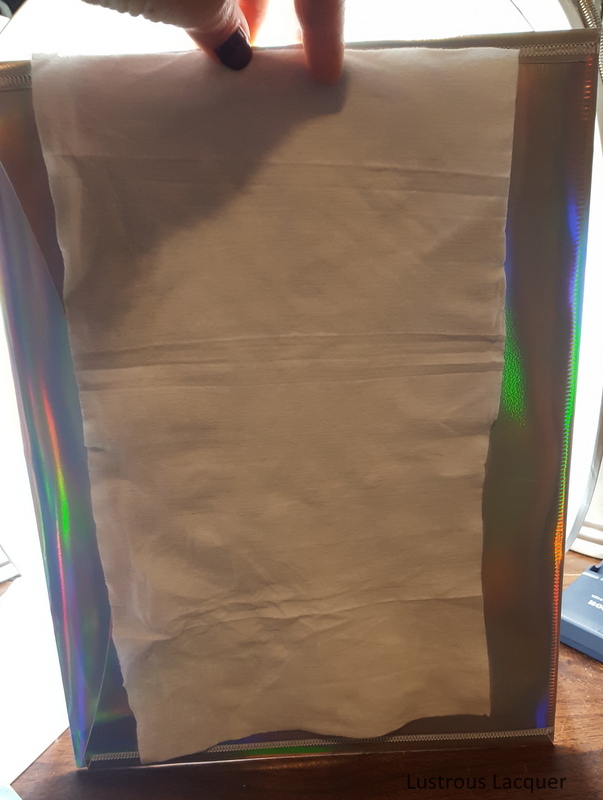 Holos/Multichromes will be $12 and Shimmers/Cremes will be $10. Happy Friday everyone! I hope your week went well and that you get to enjoy the weekend. I don't have a lot of plans, except to work on a lot of swatching and try to get ahead on blog posts. 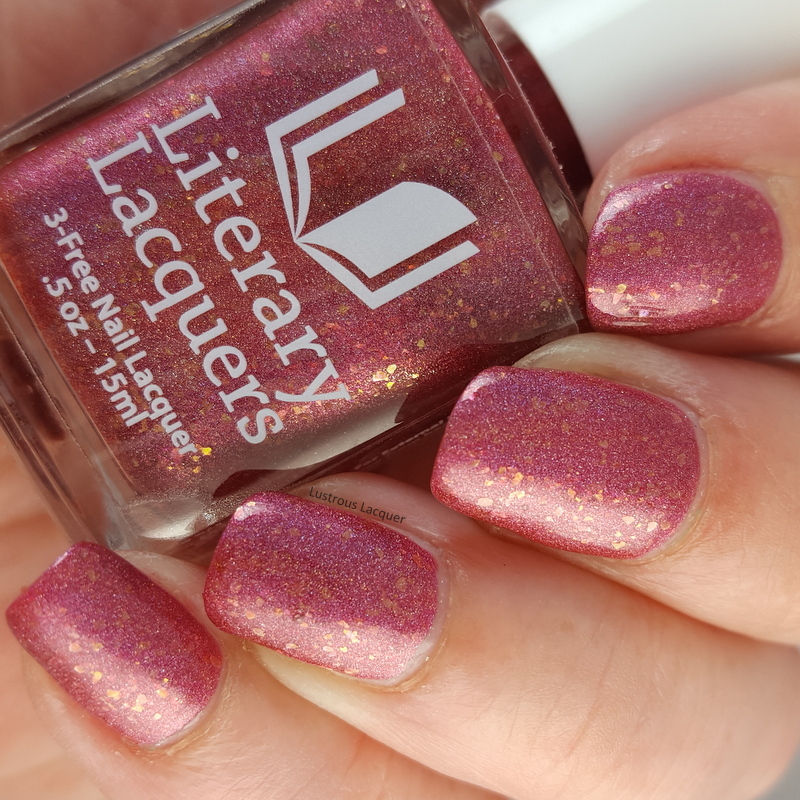 For those of you who follow me on snapchat (I'm lustrouslacquer if you want to add me) you got a full preview of all the polish I have piling up to review, I also posted a glimpse on Instagram. I tend to post a lot of behind the scenes stuff on snapchat so if you're interested feel free to add me. But enough pimping of my social media let's get to the real reason you're here, the polish! Today I'm sharing one of Zoya's classic colors Kaufda which was released in late 2009 or early 2010. I haven't been able to narrow down a specific date or collection for this online. 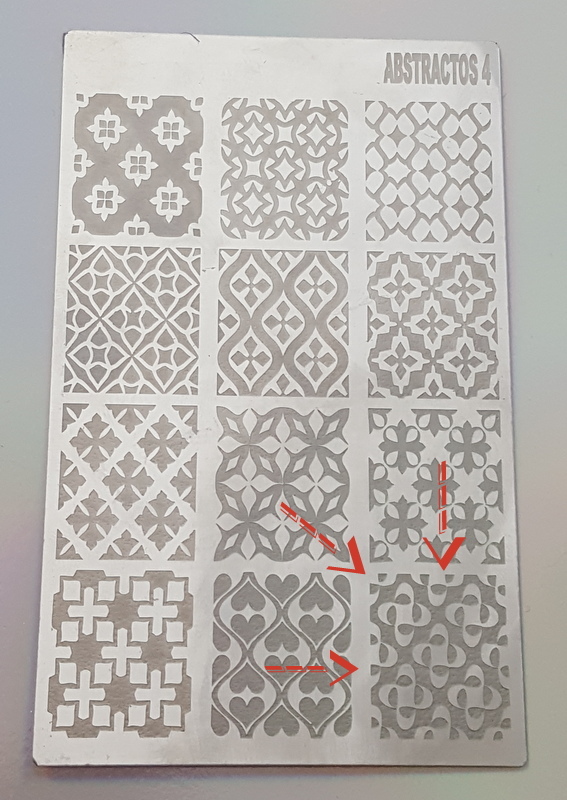 If you know please let me know in the comments. 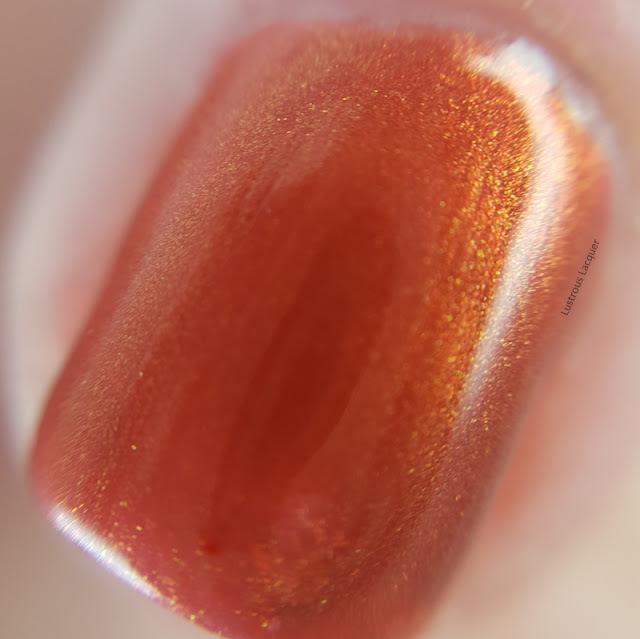 Kaufda is a rustic coppery orange polish with golden shimmer. I've had my bottle for about 4 years and didn't really mix it up well before using which may have caused the formula to be thin. I'll have to give it a good mixing and try it again to be sure. The application process was surprisingly easy and even considering the polish was so thin. The first coat was on the sheer side but more opaque than I was expecting and completely even and full opacity was reached with 2 coats. Shown here is 2 coats plus top coat. Like all shimmer finishes, Kaufda suffers from brushstrokes and is unforgiving when it comes to nail imperfections. A good top coat helps to hide some of this but sadly not all of it. I think the golden shimmer really helps illuminate the polish adding warmth and depth. 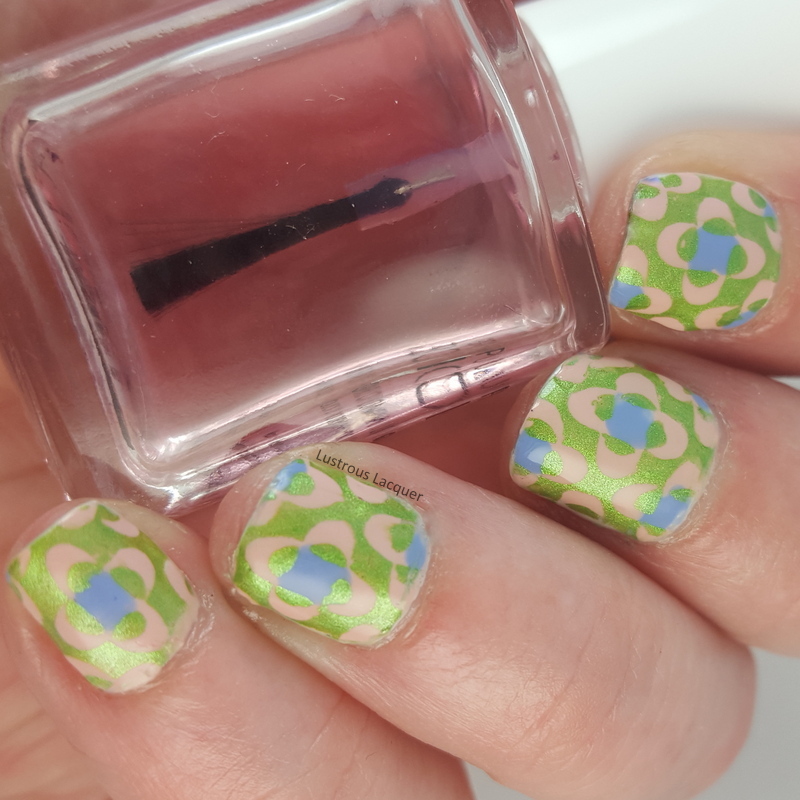 Kaufda really is a gorgeous color and really fun to wear during the summer. It's definitely one I'll be sporting on my toes in the near future. Sadly Kaufda is no longer available from Zoya but you might get lucky if you search some destashes. 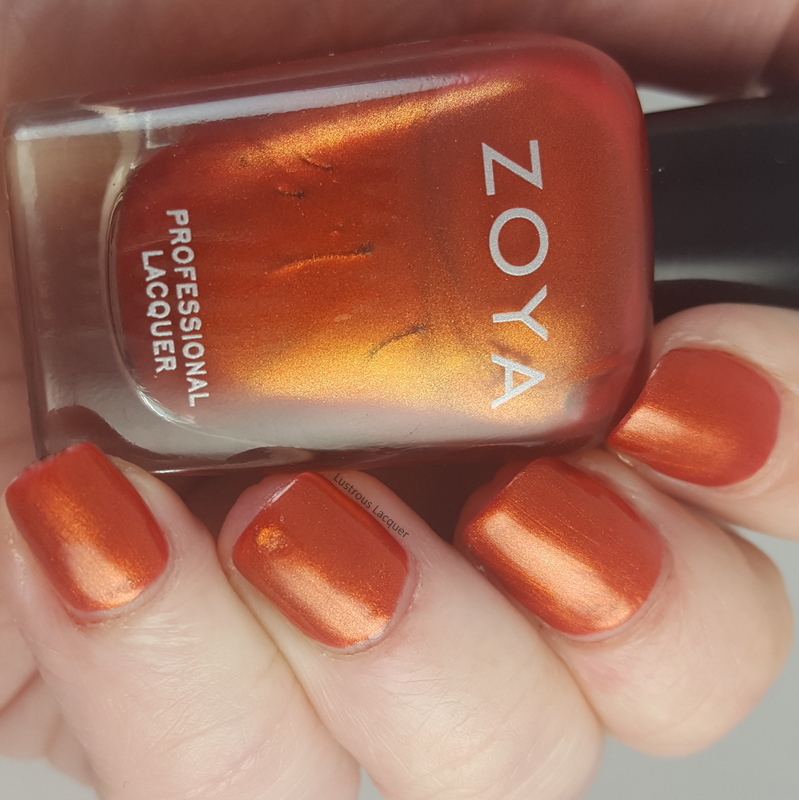 I do have some good news though, Zoya is currently running a promotion! It's Buy 3 Get 3 free with code 3Color. This promotion is valid until 7/7/17 at 11:59 pm EST. 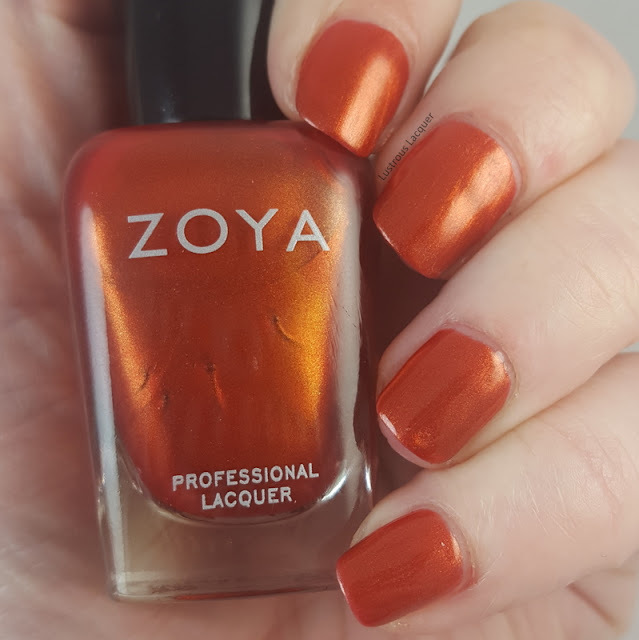 Let me know what's on your lemming list from Zoya in the comments. As always Thanks for stopping by and Happy Polishing! 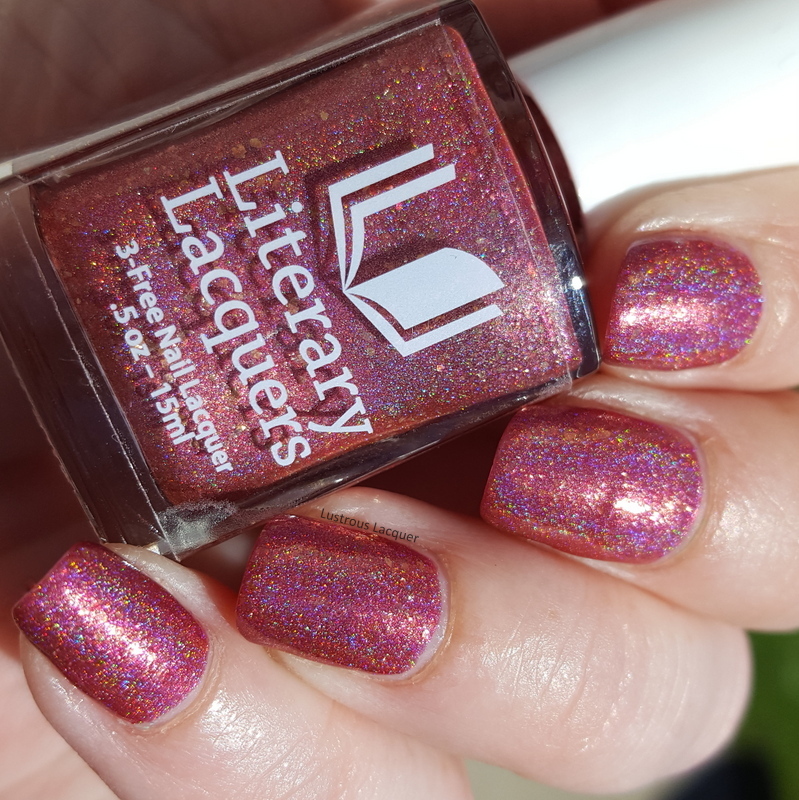 Today I have for you a gorgeous trio releasing to the core line of colors on June 23rd from Literary Lacquers. 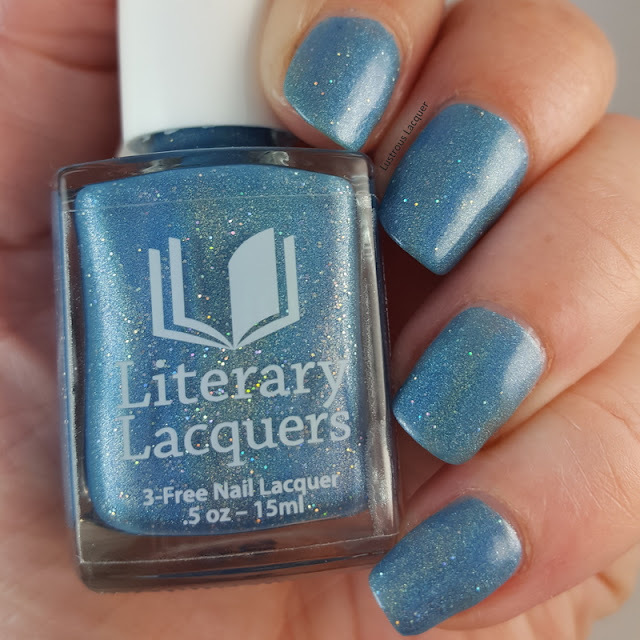 The Ocean at the End of the Lane Trio which is inspired by the book of the same name is sure to have something for everyone whether you like matte polishes, multi-chromes, glass fleck or holographic finish. Miner's Gift is described as a blue/purple multi-chrome with holographic micro flakes. 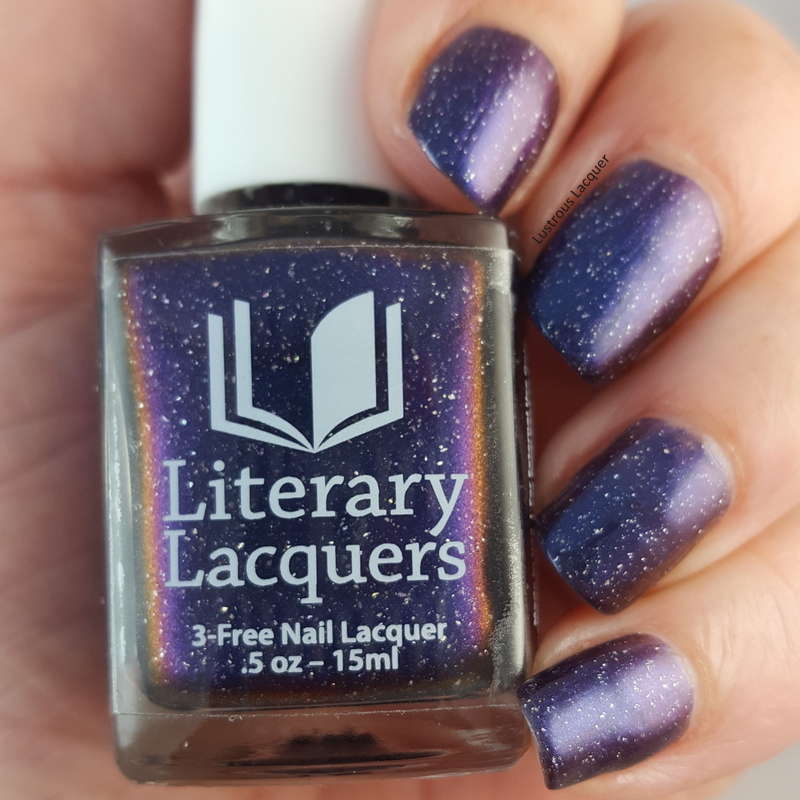 When I looked at the bottle my first impression was a deep dark blurple with gold micro glitters. Inspired by the character of the opal miner. The death of the miner is the catalyst for the awakening/actions of Skarthach. His offhandedly adult means of compensating for the loss of the one thing that gave the boy comfort is counter-balanced by Lettie’s selfless, childish (as in done by a child – not as in immature) and steadfast determination to make things right for her friends. As such, the Miner (and other adults – Hempstocks excluded) is the initial counter character to Lettie. The formula for Miner's Gift was a bit thicker than I'm used to but not to the point that it was difficult to work with. 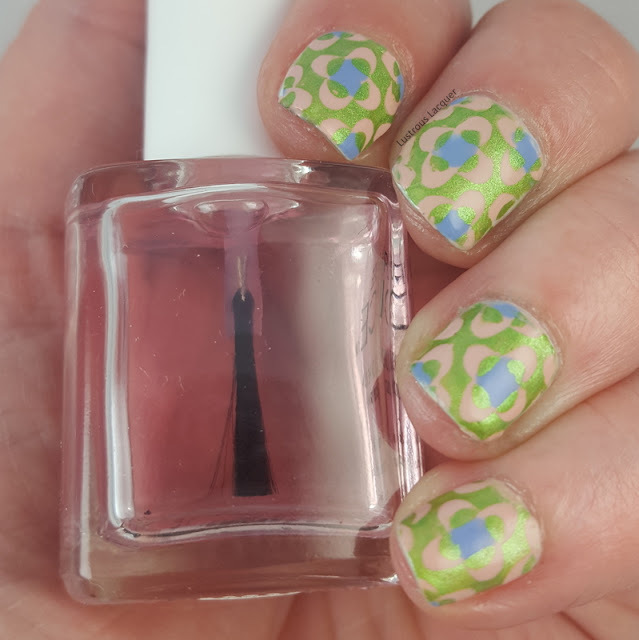 Because my nails are still recovering from my foray into builder gel nails and have a VERY distinct ridge I had a small issue with bald spots on the first coat. Everything built up nicely and you can barely see the ridge after the coat. 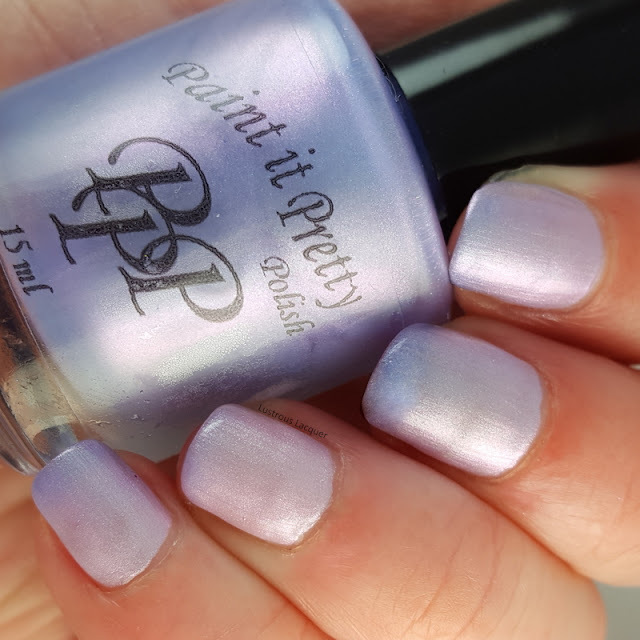 So I guess what I'm saying is that even if your nails are in rough shape this polish will make them look fabulous. And if you don't have a distinct ridge like I do you won't have any issues with application. Shown here is 2 coats plus top coat. 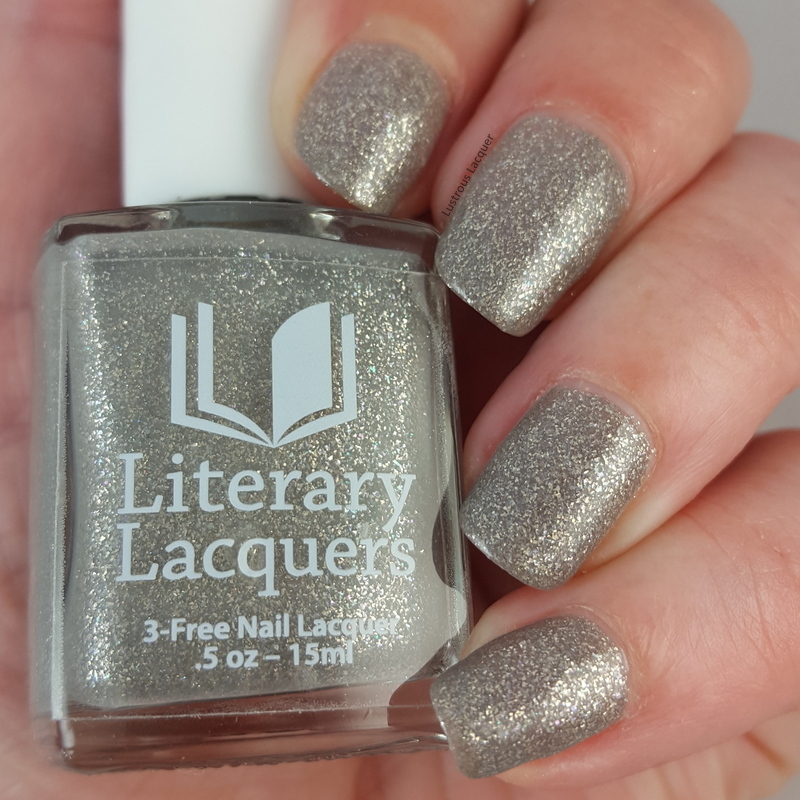 Miner's Gift dries to a smooth sparkly finish. Swaying Grayly is described as matte light grey polish packed with silver flakes and glass fleck. 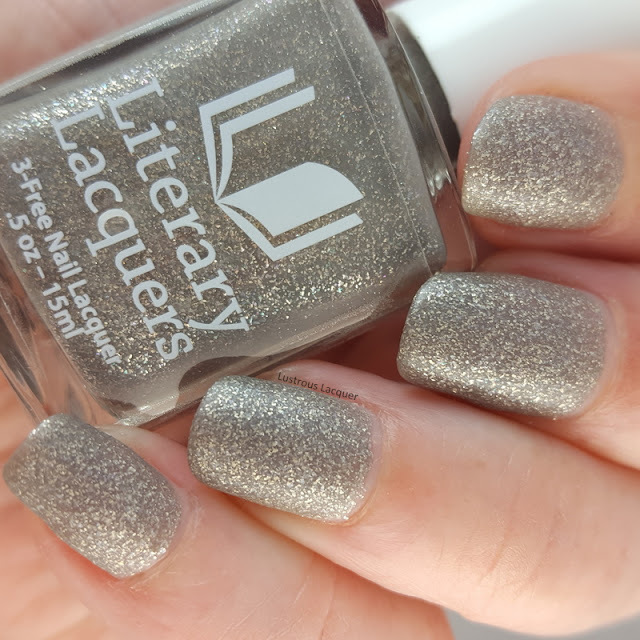 My first impression after looking at the bottle was a medium grey polish with silver and gold flecks. Inspired by the persistent description of Ursula Monkton in her true form as Skarthach of the Keep as represented by tattered grey canvas. “It was my old bedroom, but it wasn’t. Not anymore. There was the little yellow handbasin, just my size, and the walls were still robin’s-egg blue, as they had been when it was mine. But now strips of cloth hung from the ceiling, gray, ragged cloth strips, like bandages, some only a foot long, others dangling almost all the way to the floor. The window was open and the wind rustled and pushed them, so they swayed, grayly, and it seemed as if perhaps the room was moving, like a tent or a ship at sea." 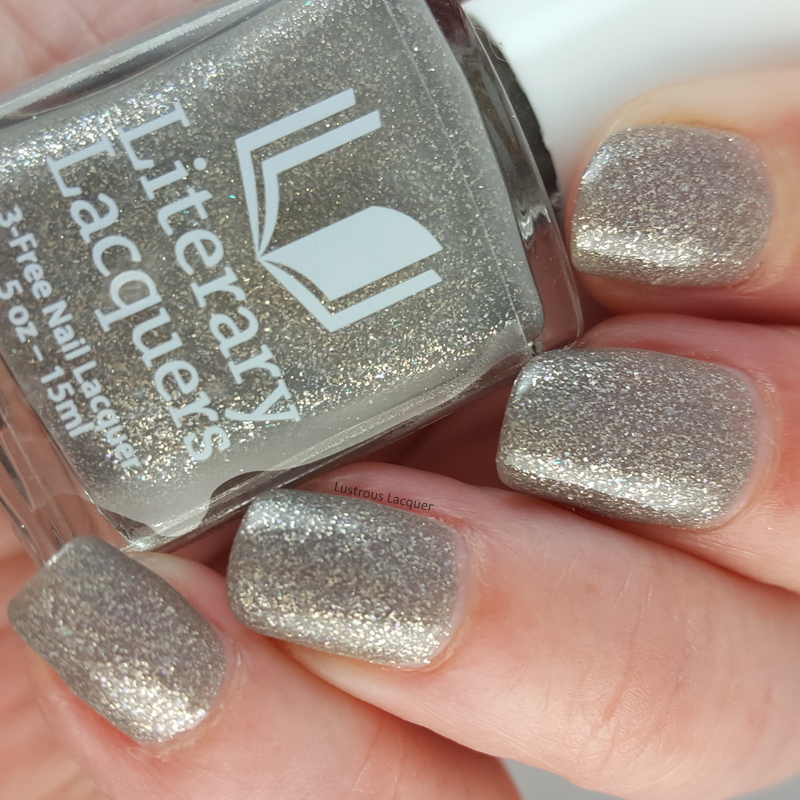 Swaying Grayly has a smooth even application and a flawless formula. each coat was packed with sparkle. Shown here as 2 coats without top coat and then the addition of a glossy top coat. Dries to a smooth finish with zero texture from the flecks. 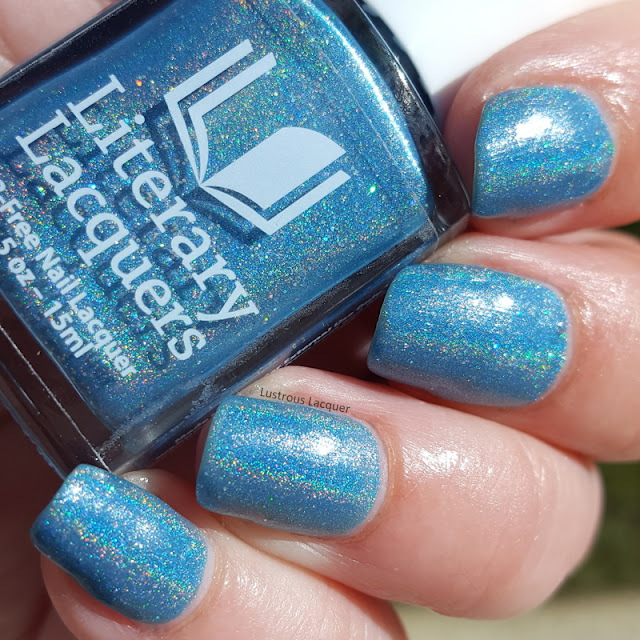 Lettie's Ocean is described as a soft turquoise holo with holo sparkle. 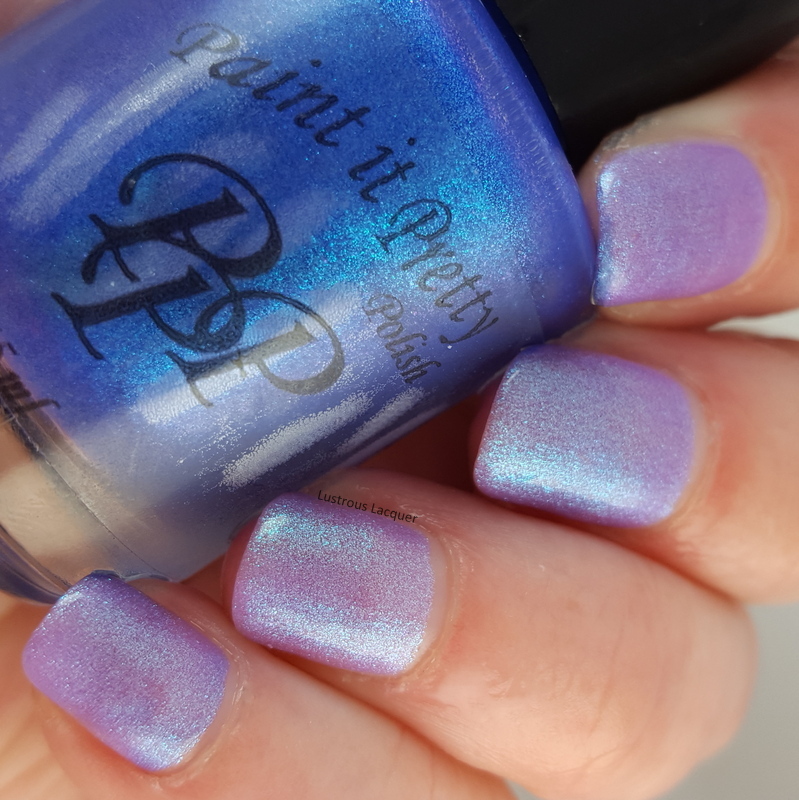 My first impression after looking at the bottle was a pale turquoise with scattered holographic glitters and a subtle hint of linear holo. Lettie is an eleven-year-old girl who just may have very well been eleven for a very long time. "Lettie Hempstock was made of silken sheets the color of ice, filled with tiny flickering candle flames, a hundred hundred candle flames. Could there be candle flames burning under the water? There could. I knew that, when I was in the ocean, and I even knew how. I understood it just as I understood Dark Matter, the material of the universe that makes up everything that must be there but we cannot find. I found myself thinking of an ocean running beneath the whole universe, like the dark seawater that laps beneath the wooden boards of an old pier: an ocean that stretches from forever to forever and is still small enough to fit inside a bucket, if you have Old Mrs. Hempstock to help you get it in there, and you ask nicely." 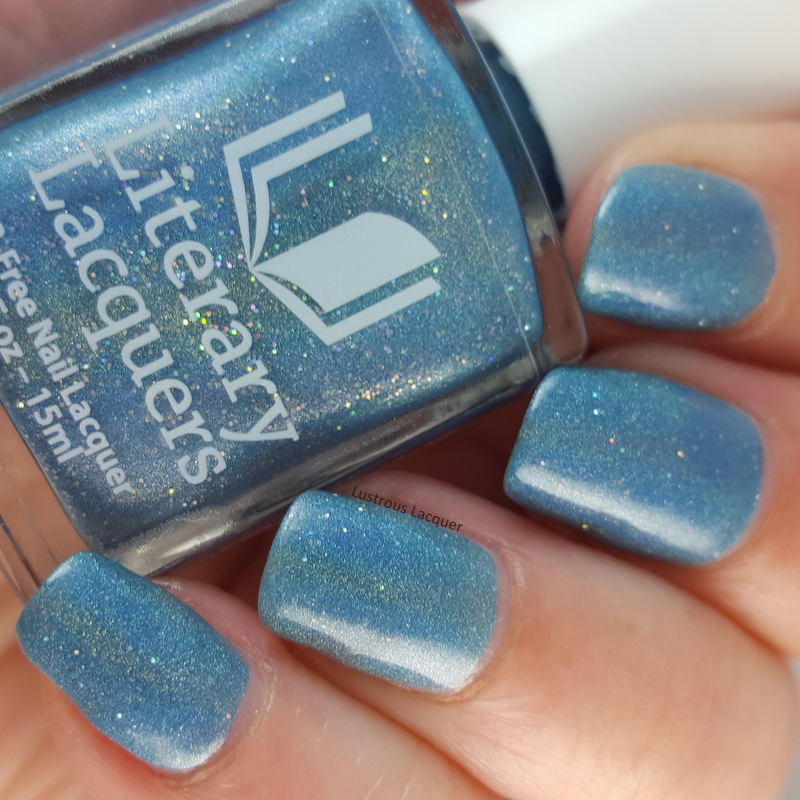 Lettie's Ocean has a smooth formula with even application. I was expecting a sheer polish that required 3 coats or more but full opacity is reached after 2 coats. Shown here is 2 coats plus top coat. Dries to a smooth even finish. I honestly don't have a favorite from the trio. I like the deep rich color contrasting with the holographic sparkle of Miner's Gift, The layered flecks in Swaying Grayly and the holographic flash in Lettie's Ocean. Can you pick a favorite? Let me know your thoughts in the comments. The Ocean at the End of the Lane Trio Releases on Friday, June 23rd from Literary Lacquers at noon MDT along with some returning favorites. Want to know what they are so you can knock out some of those lemmings? Well, you're in luck I just happen to have a list! Hello everyone, I know it's been awhile since I've posted and I'm posting outside of my normal schedule. I hope that doesn't throw everyone off. I thought once summer vacation hit, I'd have more time to devote to writing posts. Well settling into a new house and going on 2 vacations had put a damper on my free time. Don't get me wrong I'm loving every minute of it even if I've discovered that even on vacation you need more hours in the day. 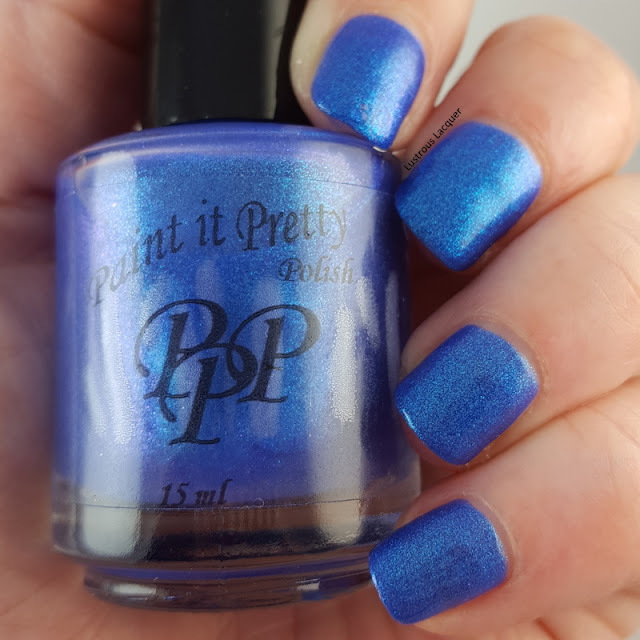 Anyway, I didn't start this post with the intention of giving you an update on my entire life, I'm writing it to show you more pretty thermal nail polishes from Paint it Pretty Polish. And they just happen to be available for purchase right now! Once again this will be a picture heavy post so I'll be keeping my words short and sweet. Each polish is photographed in my light box using daylight bulbs. 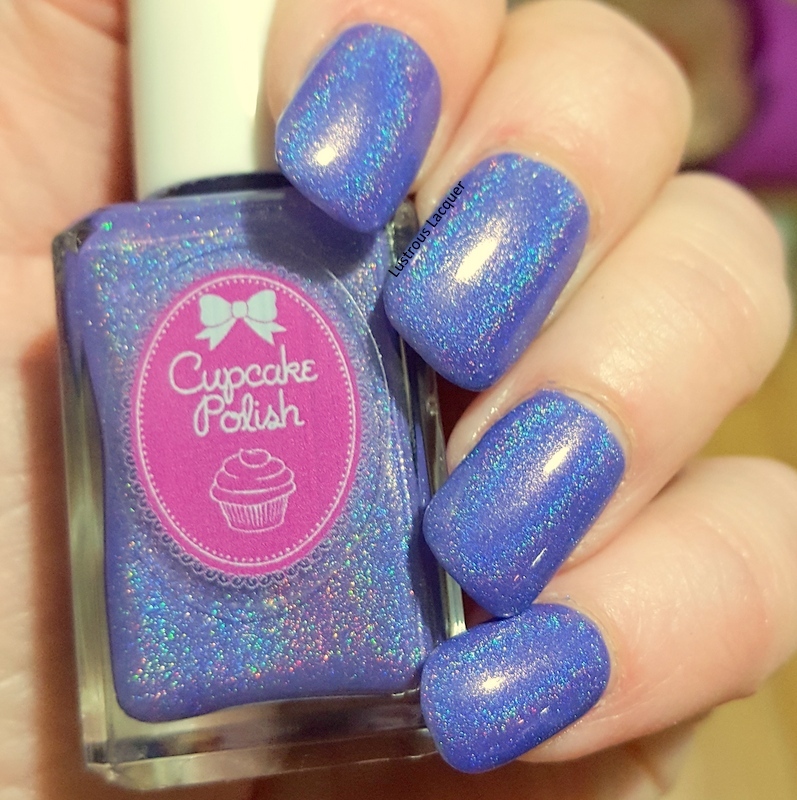 Color: In the bottle, Indigo Fire is a blurple polish with aqua shimmer. 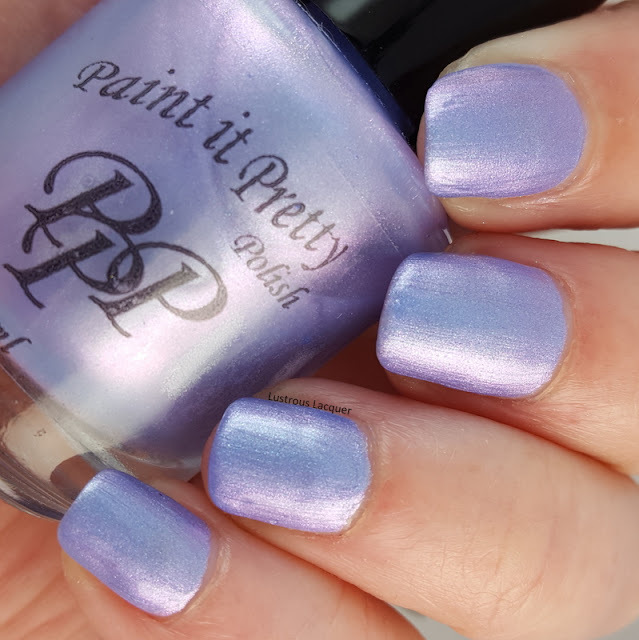 In a warm state, it's a pale purple with aqua shimmer and shifts to a deep purple with aqua shimmer when cold. Application: Smooth and easy application with tons of sparkle in each layer. Very easy to control where the polish went. It is a bit on the sheer side and shown here as 3 thin coats plus top coat. Finish: Dries to a smooth glossy finish. My overall thoughts are that I love this polish. 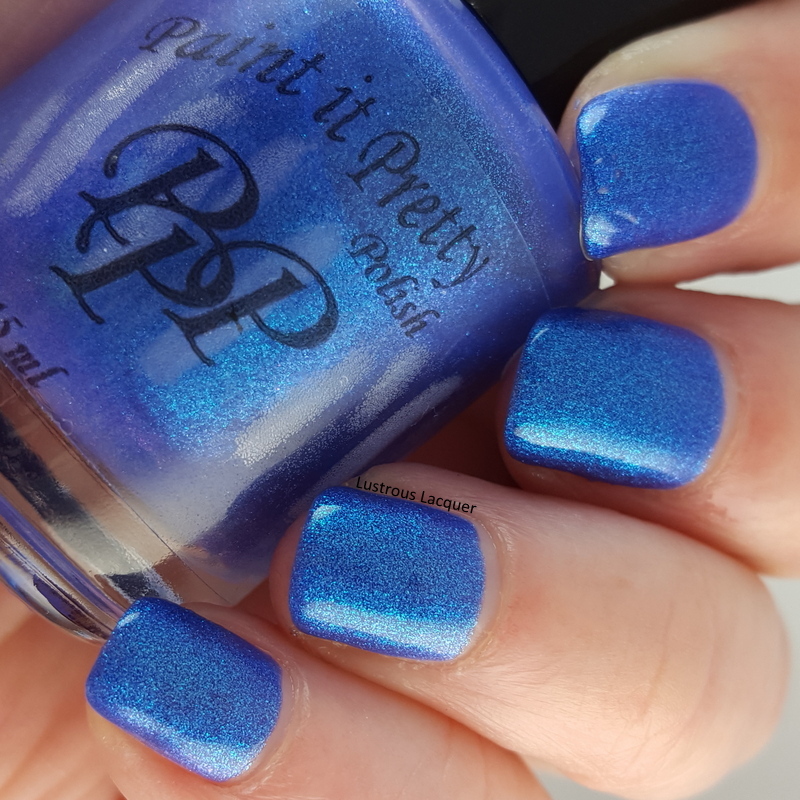 I like thermal polishes but I'm especially drawn to ones that have extreme color shifts to them. I like that distinct difference to the colors and find myself checking out my nails more often when wearing them just to catch the color shift. 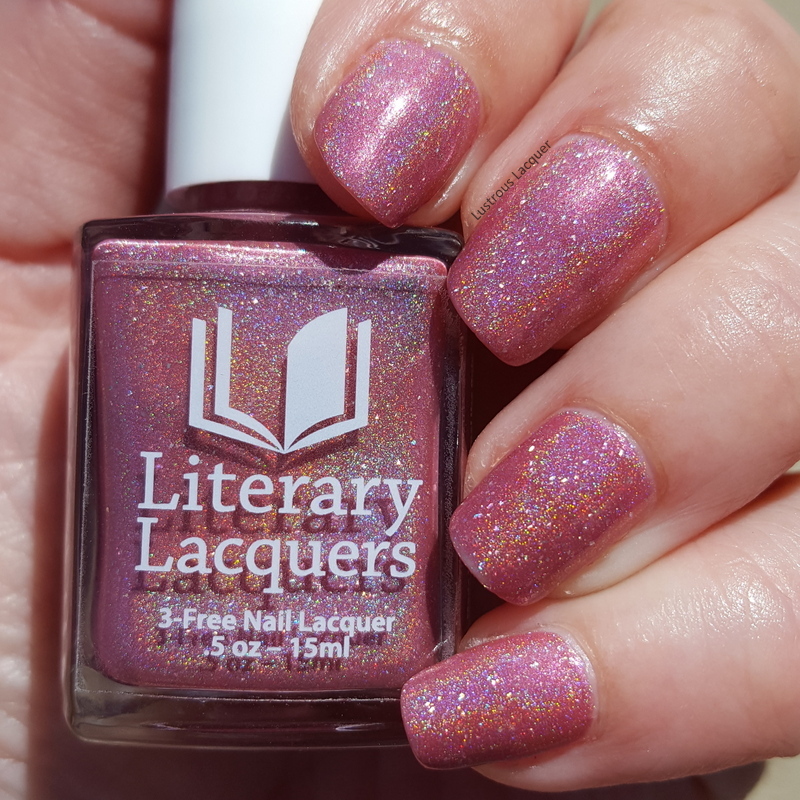 Color: In the bottle Cheers to 4 Years is a lilac purple polish with silver and pink shimmer. 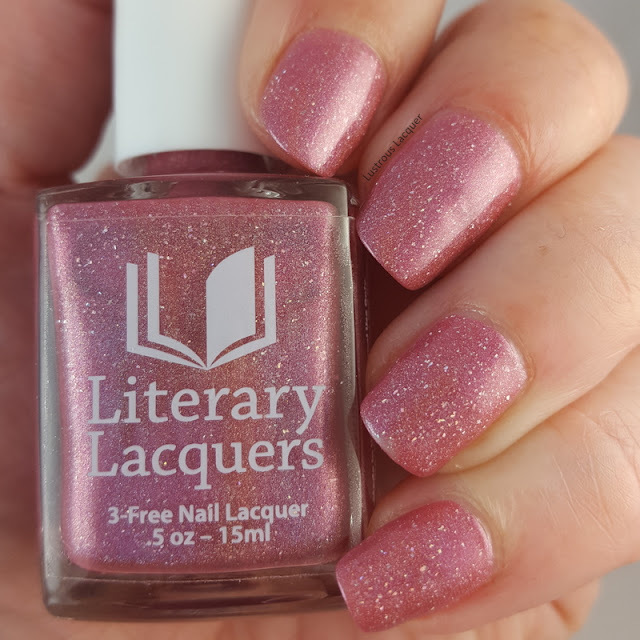 In a warm state, you get an icy pink color with silver shimmer that shifts to a pale lavender with pink undertones and silver shimer when cold. Application: Smooth and even but because it's a shimmer you get a bunch of brushstrokes. A bit more opaque than Indigo Fire so only 2 coats were needed to reach full opacity. Shown here as 2 coats plus top coat. Finish: Dries to a smooth semi-gloss finish but suffers from brushstrokes, the addition of top coat will help to hide most of them. My overall thoughts are that I like both colors that Cheers to 4 Years shifts to. I just wish they were in 2 separate polishes. The color shift is a little too subtle for my personal taste. That being said I did end up wearing this one for almost a week. Which is something that I rarely do. 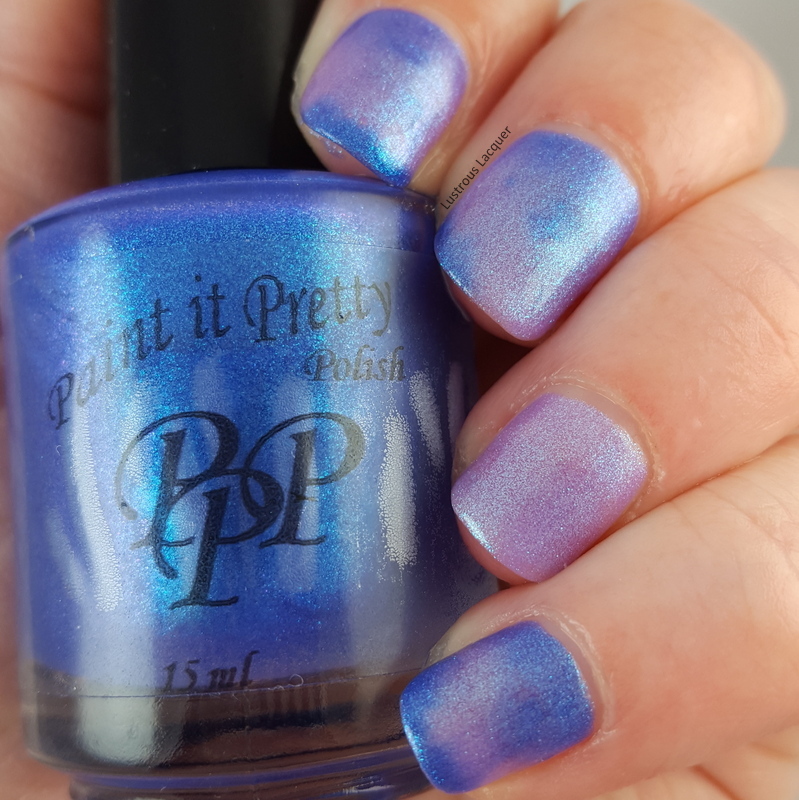 Indigo Fire and Cheers to 4 Years are both available for purchase right now from Paint it Pretty Polish along with the other 3 thermal polishes I shared with you a few weeks ago. And don't forget to check them out on Facebook to keep up with all the latest news. Thanks for stopping by and Happy Polishing!